Palliser Medical & Travel Clinic provides its patients with evidence-based and patient-centred care. Dr. Rozemin Devraj-Kizuk has been in family medicine practice for more than 25 years in Lethbridge. She opened her own clinic in 2007 and has expanded her interests and education to include travel health medicine as part of her family practice. 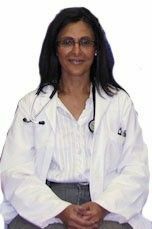 She is certified by the International Society of Travel Medicine, and she enjoys meeting people of different backgrounds and nationalities. Dr. Kizuk has a strong conviction for providing humanitarian medical care in resource-limited countries and did fieldwork in Tanzania in 2015 and 2016 and in Kenya and Bolivia in 2017 and Bolivia in 2018. She hopes to continue with these services for as long as it is physically possible for her. In Canada, she enjoys giving her time and medical care to her patients as well as to the new Canadians arriving from conflicted areas of the world. Her own travel across continents started with her childhood in Tanzania, East Africa followed by her secondary education in London, England and subsequently obtaining her medical degree with a specialization in Family Medicine as well as Masters of Science from the University of McMaster and the University of Toronto in Ontario, Canada. She enjoys learning about different cultures, being a mother to her two children, hockey and cats. Palliser Medical & Travel Clinic is also fortunate to have the addition of two very qualified and personable physicians. We are expanding and looking to have more physicians join us in the near future. Dr. Victor Onyebukwa is a South African trained family physician with a Master of Medicine (Family Medicine) degree from Stellenbosch University, Cape Town. He obtained his primary qualification in Nigeria in 1998 and also holds a Diploma in Child Health from the Colleges of Medicine of South Africa. He has practiced extensively in both Nigeria and South Africa and is excited to build a practice in Lethbridge. He is currently accepting new patients. Dr. Jerrett Stephenson was born in Red Deer, Alberta. He studied medicine at the University of Alberta and graduated in 2013. He completed his residency in Rural Family Medicine through the University of Calgary's program administered in Lethbridge, Alberta. After finishing residency in 2015, Dr. Stephenson worked as a travelling locum physician in several rural Alberta locations before opening his practice with the Palliser Medical & Travel Clinic in September of 2016. He is currently taking new patients. Dr. Bazgha Sial completed family medicine postgraduate training in 2016. Prefers to be involved in diversified population health care. Interested in team-based health management plan with periodic checkups for women and paediatric groups. She is taking new patients. Dr. Ghazala Saif graduated from the Rawalpindi Medical College and completed her Family Medicine residency at the Fatima Memorial Hospital, Pakistan. Dr. Saif offers comprehensive patient centered care and has a special interest in women’s health, family and internal medicine, and minor surgeries. She is a warm and caring family practitioner and strongly believes in helping her patients live a high quality lifestyle. She is fluent in English, Urdu, Hindi and Punjabi and thrilled to be part of our medical family. Dr. Iffat Waheed graduated from Rawalpindi Medical College, Pakistan in 1998. She completed one year Residency in Internal medicine and General surgery after graduation. Later, she worked as a family physician in a busy family practice. Recently she has completed post graduate training in family medicine from Fatima memorial hospital, Pakistan. She is drawn by the close-knit community feeling of Lethbridge and loves its trails and scenic beauty. She is eager to join Palliser Medical and Travel clinic and to serve community of Lethbridge. Palliser Medical & Travel Clinic is currently taking new patients to join our family practice care. Our clinic offers medical risk assessment for your specific travel itinerary and we focus on helping to keep you well while you are travelling. Recommendations on travel vaccines depend on your travel itinerary. Some vaccinations, such as yellow fever and polio, may be required for entry into your destination country. Shingles vaccine and Gardasil® are also available. Our clinic follows CDC, WHO and PHAC guidelines. All vaccines are available on site. Services for travel health are not covered by Alberta Health Services, but we will give you the information you need to submit to your health spending accounts or insurance company. We are a full-service medical clinic with six full-time family physicians. We offer patient-centred care, and we are a community partner with Lethbridge Family Services to provide care to our new Canadians. We specialize in cosmetic medicine, botox and dermal fillers, women's health and travel medicine as well as Intrauterine device (IUD) insertion clinics for Mirena® and Jaydess®.